Not too many sports organizations around the country in any sport or league can be super thrilled with their attendance figures. UCF, despite its extensive efforts, certainly can’t be. Marketing and social media presence certainly isn’t the problem. People just aren’t showing up like they could, and should, be. What’s the problem? Whenever that question is asked, the same group tends to get the blame. After an announced crowd of just 34,022 showed up for the Knights’ 40-13 win over preseason AAC West favorite Memphis, I looked at Twitter and saw some familiar responses. “Where are the students? The school has an enrollment of over 60,000 and we can’t even get one-third of those kids to show up?” Everyone loves to throw blame around and the go-to target is the student population. I get it. Millennials are an easy target in today’s world. But, here’s this. After setting a student attendance record in the season opener, the students once again filled up two student sections at the Memphis game. Both end zones were full. Could there have been more? Sure. But when I looked at the sideline seating, there sure was a lot of silver. There were plenty of empty seats. And what was really disappointing was that all of this came after athletic director Danny White’s “#SelloutSpectrum” movement. After all that White has done in his short time in Orlando, that was all he could get in return? I understand that the game was rescheduled and prior plans or changing travel reservations provided difficulty. Even still, I think back to that early-September night when Hurricane Irma forced a cancellation of the game. It was impossible to escape the huge waves of UCF fans griping and begging for it to get rescheduled. Well, White did his part. The team did theirs. The students, for the most part, did theirs. The rest of the fan base? Not so much. Don’t think that coach Scott Frost didn’t notice, either. Where are the students? Oh, they’re showing up. The 60,000-plus enrollment question comes all the time, but what about all of the alums in the area? There are, what, 100,000 of them? And not even 30,000 of them can show up for one of the biggest home games in recent years? UCF deserves better. This Saturday, fans have another chance. It should be easy. UCF is ranked, undefeated and playing exciting football. A 7 p.m. kickoff. It’s homecoming. This should be an easy one. 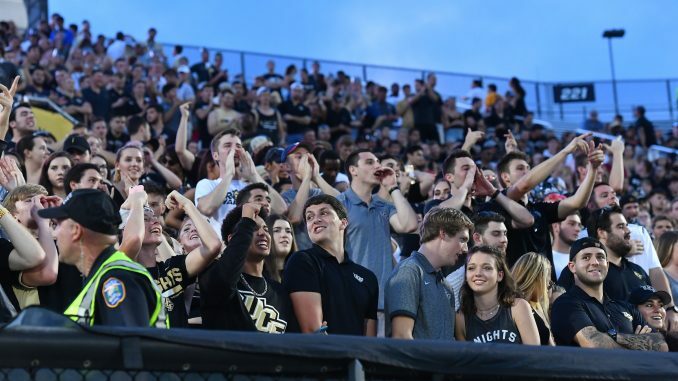 Saturday marks the Knights’ first home game as a ranked team since 2013. Will the crowd fit the circumstances?